Six Axis Palletising Robot | PAK Automation Ltd.
By their nature cement roof tiles are awkward, heavy and hazardous to handle, lift and pack for delivery to customers. Health & Safety risks can lead to costly accidents both in terms of employee injury claims and product wastage from breakages. When this client sought help from PAK Automation, the introduction of a Six Axis Palletising Robot (Model ZX 130L) not only reduced the Health & Safety risks, but also improved line efficiencies and produced neater pallets. 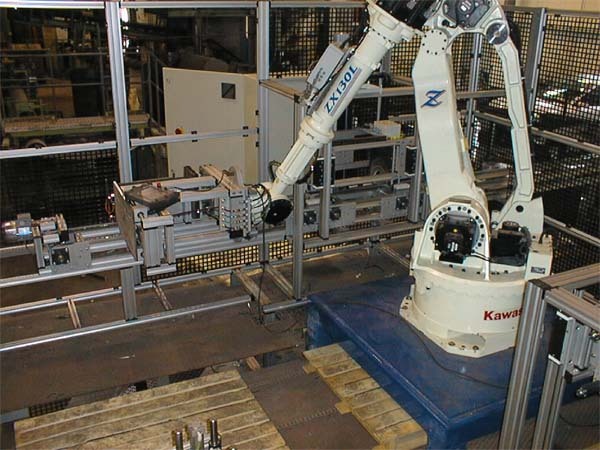 The Kawasaki Robot in this cell is picking and placing roof tiles that have been stacked by a custom built servo driven stacker. There are two stackers in the cell because the cell is fed with two independent lines which run different product styles. The stackers stack a ridge style roof tile in fours vertically, then release all four which are picked up by the robot and placed, standing upright, on the pallet. The stacker handles in excess of twenty units per minute. The overall cell, including all conveyors and both stackers, is controlled from a PLC Master which in turn signals to the Robot. The PLC is also talking to the two Stacker Servos and issuing their control commands. Their positions are stored internally in the Servo drives. The pallets are fed to the cell under the robot base for space saving, and come from a pallet magazine. The pallet also requires a layer sheet which is picked up by the Robot during the cycle from a layer sheet stack located inside the cell. The Robot gripper is fitted with four suction cups that are mounted off to one side. When a layer sheet is required the gripper goes to the layer sheet stack, orientated on its side, and when a vacuum is made it takes the layer sheet and places it on top of row one of the pallet. When the pallet is complete it exits the cell through a SICK safety light curtain which is a two beam device and has safety muting for the period of time whilst the pallet leaves the cell.